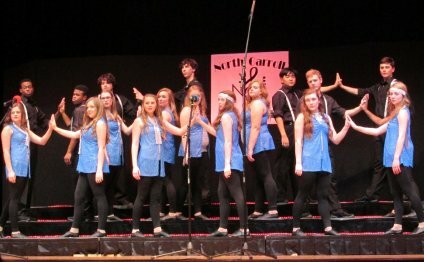 The Carroll High School Show Choirs are all set to host the 2014 Carroll Classic Show Choir Invitational. Beginning on Friday, March 14th at 7pm, they will be hosting the middle school division with 5 schools attending and will be co-hosted by Carroll Middle School who will have an exhibition performance. On Saturday, March 15th starting at 8am, they will be hosting 22 groups from 13 different high schools. Performances will run throughout the day, including a solo competition, and culminate around 11:30pm with the naming of the day’s Grand Champions. The cost for attending the Friday night shows is $5.00 and Saturday shows are $10.00 for either the day or night shows, and $15.00 for the whole day. This is great entertainment from hundreds of talented young men and women, and will include exhibition performances by Carroll’s own Select Sound and Minstrel Magic! Come out and see what all the excitement is about!